In 44BC, Julius Caesar was murdered by a group of men involved in a clandestine plot that is said to have possibly consisted of up to 60 members. Taking this bit of history and mixing in their own melodramatic flair, Capcom goes about telling the yarn of Caesar's assassination. Players assume the role of the Imperator's nephew Octavianus and his close friend Marcus Agrippa. With players controlling Octavianus (later Augustus), Rome itself will be explored, and historical figures like Cicero and Marcus Brutus will be met. To hide the truth, the conspirators tap Agrippa's father Vispanius as the sole murderer of Caesar, leading Agrippa to become a gladiator to win the right to kill the true murderer, and, in the process of climbing the ranks of gladiators, being able to find out the full truth and save his father. In what has to be one of the strangest combinations in a game of late, Capcom decided to mix gladiatorial combat with stealth. While Agrippa fights in vicious arena battles against both man and beast, Octavianus is left creeping around Rome, clinging against walls, crawling through bushes, and slapping unsuspecting guards around with vases. As Octavianus trails key figures and eavesdrops on conversations, he will go to the Senate, the Forum, and a handful of other locations, sneaking in to buildings and handling minor puzzles, like figuring out the proper sequence of sentences during a speech to rile the citizenry. On the city streets, he can go about as he wishes, for the most part, but once inside a structure or on an estate, he needs to assume the role of whatever costume he finds. Since he can't fight, this means that he has to use vases, as well as honey, ars of wine and torches to create distractions to knock out, or sneak past, slaves and guards so that he can take their uniform. 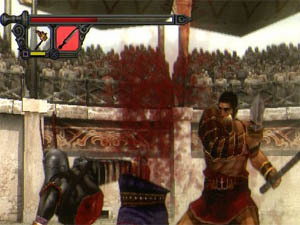 The gladiator matches are some of the most raucous fun you'll have on the PlayStation 2. It isn't overly complex, but it has enough moves and weapon variety to keep the fights fun. Whenever Agrippa's initial weapon breaks, he can pick up those of his fallen enemy or one tossed into the arena from the crowd. I wish the bouts were more man vs. beast and free-for-alls, especially since they added a few team bouts and hostage rescues. The team-based bouts are absolutely infuriating, with team members who refuse to do anything but stay in one place or lift levers so that gates around statues lower, allowing them to be destroyed - obviously, this is a problem when the goal is that the team who destroys the other team's statues first wins. Someone had to have realized how broken these were, but, alas, they have to be tolerated to enjoy the rest. As a gladiator, the love of the crowd is crucial. This means that combos, stealing weapons, dodging attacks, and gory moves will get salvo points and fill a gauge. Once a gauge is filled, Agrippa can lift his arms and cheer at the crowd, who will toss him food to help replenish his health or, if he has them riled up appropriately, a giant weapon. The larger weapons are incredibly fun to use, which include giant swords and maces, which will sever arms, legs, and crush heads, with each successful blow getting cheers and rose pedals thrown from the stands. To really get the crowd's juices flowing, beat another gladiator with their own severed arm, insult them by fighting them with a rose, or raise a severed head - the latter is a pretty rare occurrence. The normal weapons include scimitars that can cut off limbs and heads, maces to bash heads in, and morning stars that slap other gladiators around with head blows that send them falling in pain. There are also a few chariot races. As Agrippa climbs up the ranks, he has to fight the men in a special unit ran by Decius Brutus. These soldiers are special units trained to fight with animals and unique weapons. None of those units are particularly hard to best, which makes the fights a bit anticlimactic, but the chariot race and its boss battle are great. Racing consists of whipping horses enough to get them motivated but not enough to exhaust them, while duelling with other riders and also keeping damage to the chariot itself under control. Graphically, Rome itself also lacks the grandeur most would come to expect. The city streets are barely populated and most structures are fairly basic. The intro sequence is fantastic, and the character designs and costumes look great, but everything else is bland. 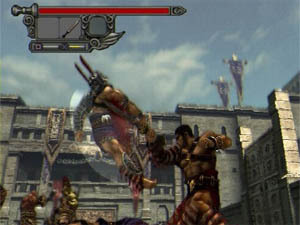 The combat looks good, with blood staying on the ground and sparks flying from locked swords and battered shields, but the gladiators consist of just a handful of designs. The music is nice but is kind of low-key for the subject matter. The music in the arena is appropriately downplayed for the roar of the crowed and weapon effects. Synching is also done well, and the voices are matched well to the characters. The hustle and bustle of a Roman city street would have certainly been nice, even if it was relegated to just one path or so. A simple taste of the hectic life back then would have gone a long way. 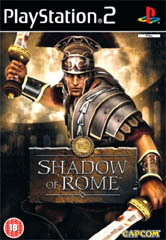 In conclusion, Shadow of Rome is a strange game that promised much but unfortunately failed to deliver on both parts. It's a cross between Metal Gear Solid meets Gladiator but unfortunately the combat scenes were used a little too much in this game, especially for the content of the storyline. With that said, the combat of the game is extremely fun but unfortunately it does become a little stale and there should of been more excitement and I would recommend this title for newbie gamers that wish an accessible hack and slash game without all the difficulties.